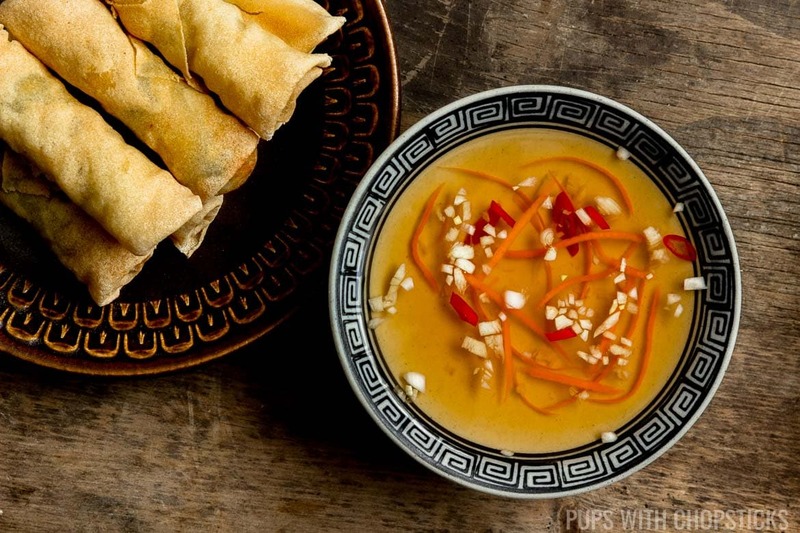 If you ever had Vietnamese food either at a restaurant, with family or at a friends place, you’ll know exactly what I mean when I say – those little bowls of dipping sauces that come with your spring rolls (both fresh and fried), grilled meats and Bun Cha (Vermicelli Noodle Bowls) are flavor bombs! Those little bowls of liquid gold are what they call Nuoc Cham or Nuoc Mam, which is a Vietnamese dipping sauce made of fish sauce! 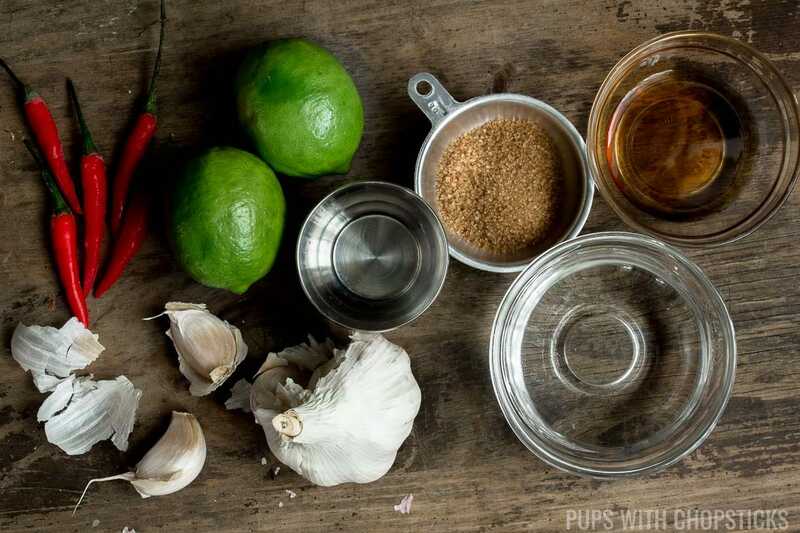 If you have never had Vietnamese Fish Sauce Dipping Sauce (Nuoc Cham / Nuoc Mam) before, this a light and refreshing garlicky dipping sauce with a balance of sweet, sour and salty flavors with the use of fish sauce, sugar and fresh lime juice (or vinegar). 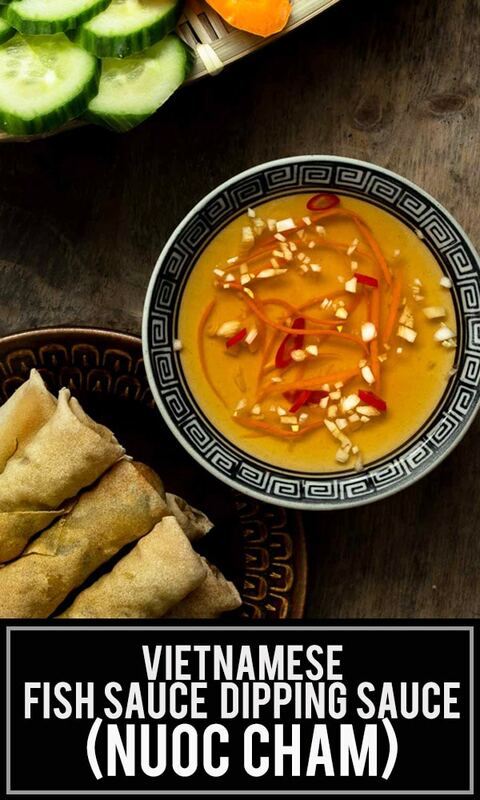 Anyone who has tried and loved nuoc cham dipping sauce will probably have a personal preference with how they like it. 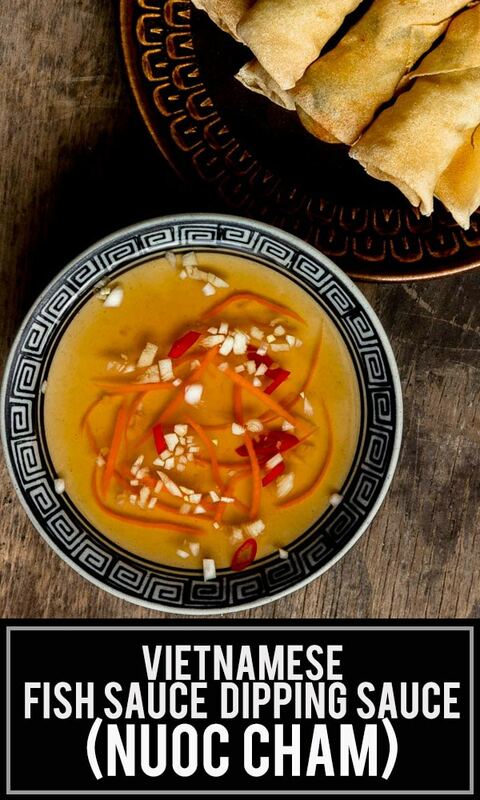 Some people like it sourer, others like it a little more sweet or salty and some like it super garlicky! 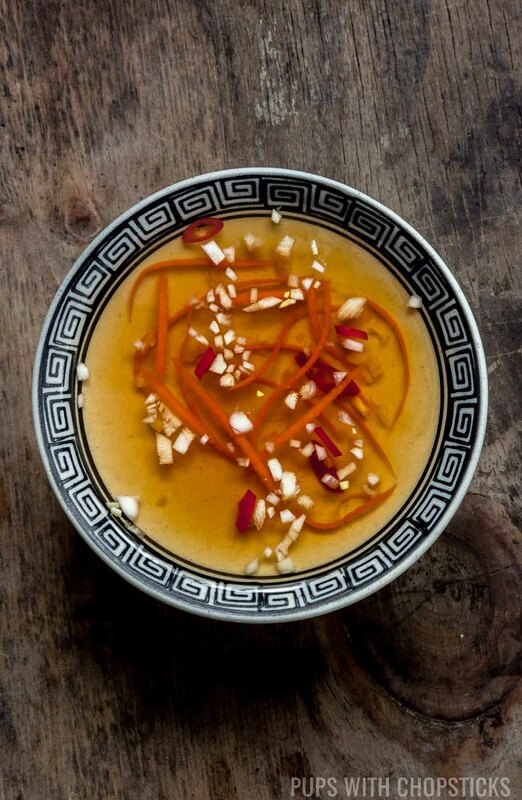 I personally like mine slightly on the sweet and sour side with a good balance of garlic but the awesome thing about this sauce is, it is super easy to tweak to your personal preference by just adjusting the fish sauce (the salty), the lime juice/vinegar (the sour) and the sugar (the sweet). 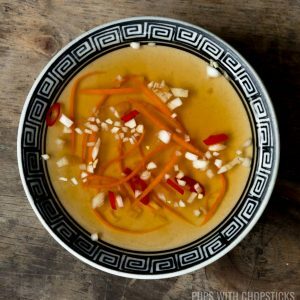 For this Vietnamese Fish Sauce Dipping Sauce (Nuoc Cham / Nuoc Mam) recipe, you can find most of the ingredients at a local grocery store with the exception of fish sauce. If you can’t find fish sauce in the ‘International’ aisle of your grocery store, then you can find it at an Asian grocery store or online – but I highly recommend buying it locally, since fish sauce that has been leaked from a broken bottle during shipping is quite potent and smelly. 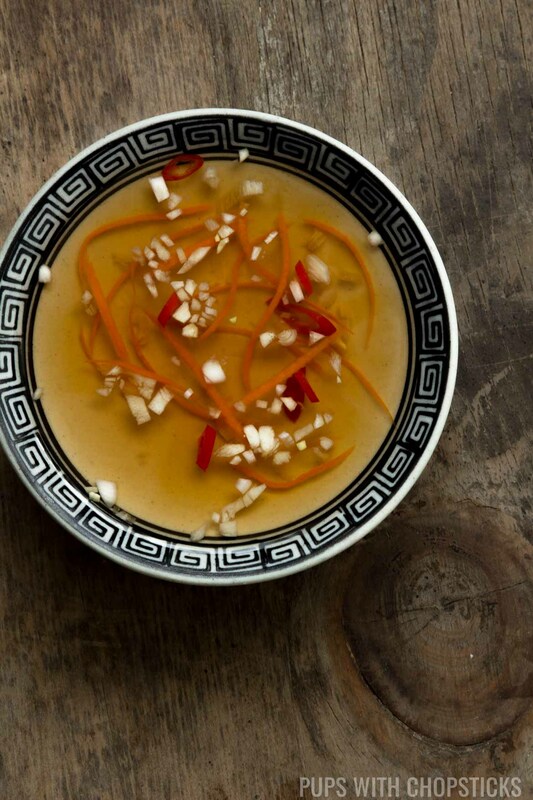 When you are making Nuoc Cham, you pretty much can throw everything into a bowl or jar and mix it together. However, I did add a couple of extra small steps that helped take the sharp bite of the garlic flavor. Whenever I make Vietnamese Fish Sauce Dipping Sauce (Nuoc Cham / Nuoc Mam), I personally like to use fresh lime juice because of the additional flavor fresh limes give it. 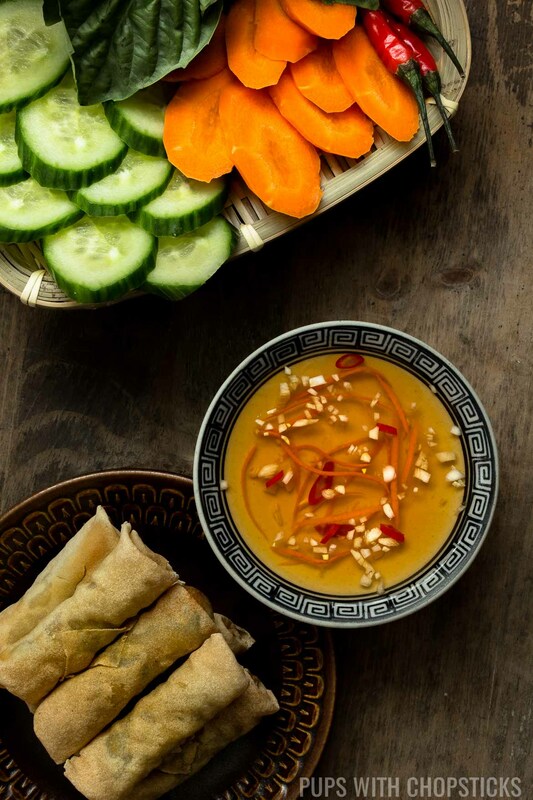 However, most Vietnamese dipping sauces made at restaurants usually use white vinegar or rice vinegar, mostly because it’s a lot cheaper to produce. There is absolutely nothing wrong with using vinegar! From time to time I will also use vinegar when I am out of limes at home as well. One of the main differences, I noticed between vinegar and fresh lime juice is the sour level and flavor. Vinegar is slightly less sour compared to fresh lime juice, and lime juice has a slight fruity lime flavor which vinegar does not have. 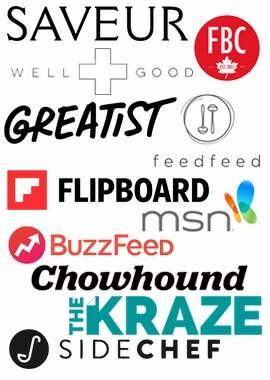 Use what you have on hand, or what your personal preference is! 🙂 Use fresh lime juice and not the bottled stuff, there is a big difference in flavor between the two. 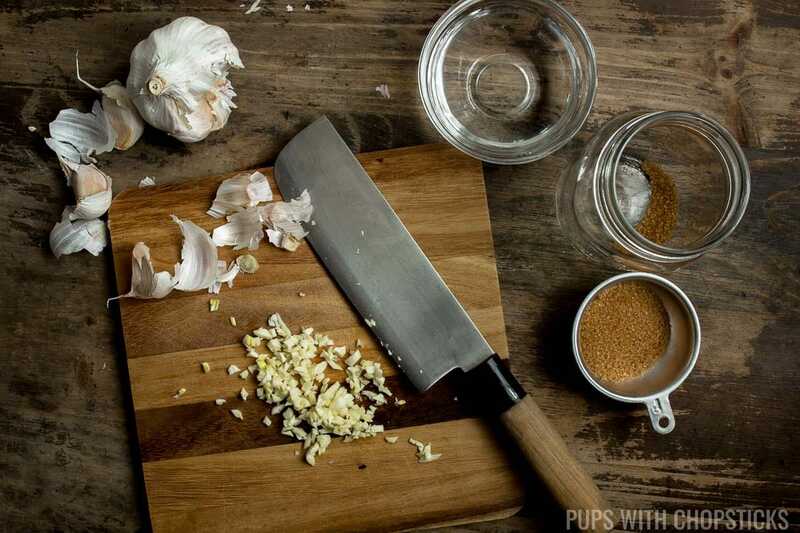 If you have ever eaten anything that has raw garlic in it, you will notice that raw garlic can pack quite a punch. It has a harsher garlic flavor, as well as a spiciness to it. Depending on how much you love garlic, you can actually tone that garlickiness down a notch by soaking it in lime juice for 15 minutes before combining the rest of the ingredients to make the sauce. 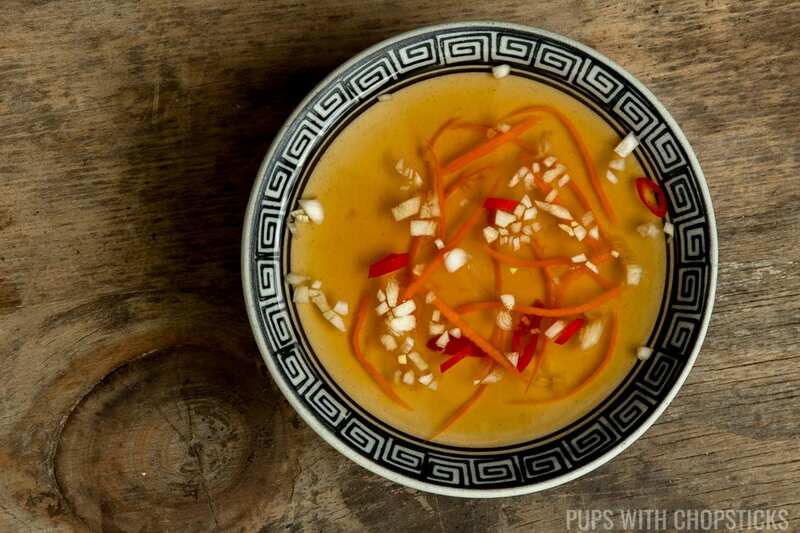 I like to use hot water whenever I make Vietnamese Fish Sauce Dipping Sauce (Nuoc Cham / Nuoc Mam) so that it is a lot easier to use hot water to dissolve and melt the sugar granules. I like to add the sugar and hot water into the bowl with the lime juice and garlic after it has mingled for 15 minutes first to remove that sharp spicy garlic bite. How long you can store this is highly dependent on whether you use vinegar in the sauce. If you are using only fresh lime juice, then I would not keep this for more than a week or two, but is best enjoyed fresh. If there is vinegar in it, you can keep it for about 2 months. Make sure you store it in an airtight jar in the fridge. I like to use this stuff a lot, especially in the summertime so I like to double or triple the batch when I make it. 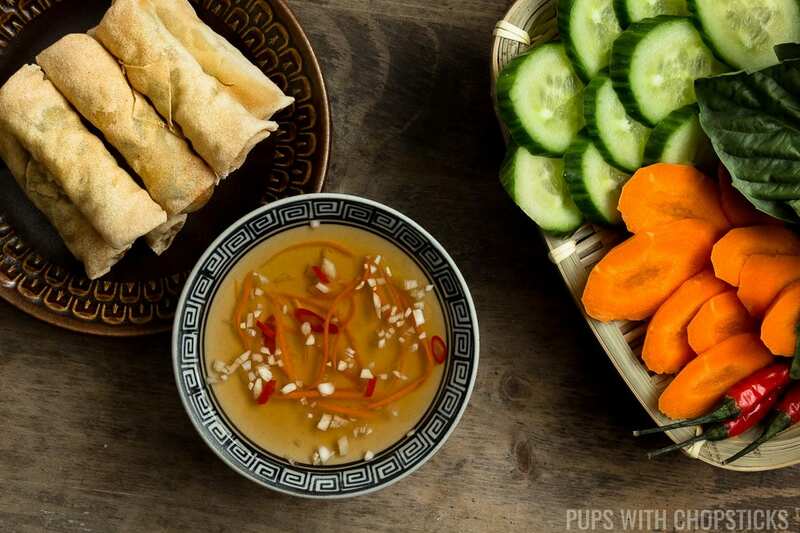 Here are a few things you can serve this with if you have any extra dipping sauce! Cut the lime in half and squeeze all the lime juice into the bowl (or jar) with the garlic and let it sit for about 10-15 minutes. 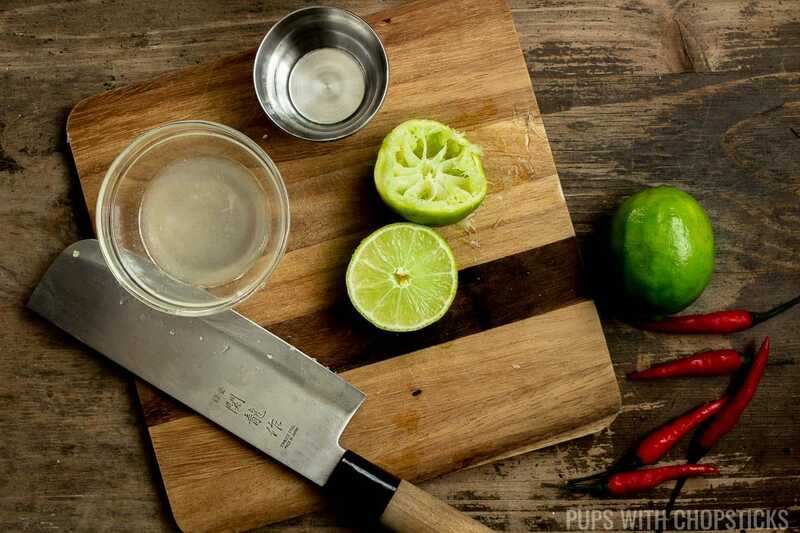 The acid from the lime juice will cut the sharp garlic spicy bite. 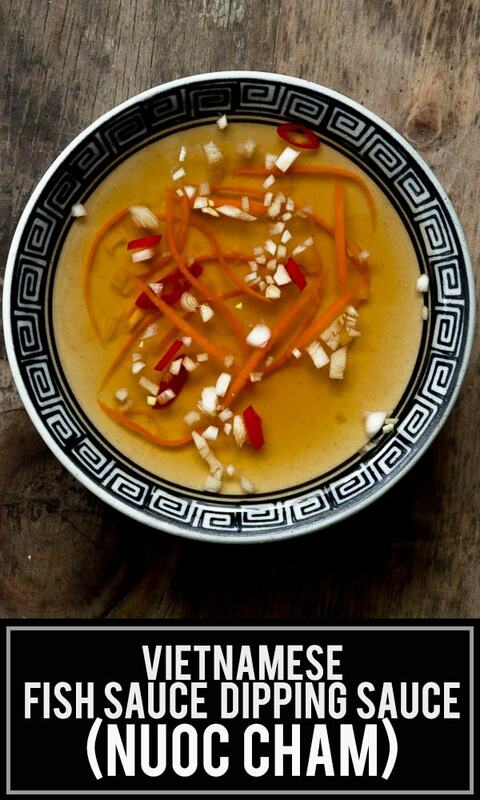 Once 10-15 minutes is up, add the sugar into the garlic/lime juice mix and pour in the hot water. Stir everything together until the sugar dissolves completely. Once the sugar has dissolved, add in the fish sauce and mix. Most restaurants use vinegar instead of fresh lime juice. 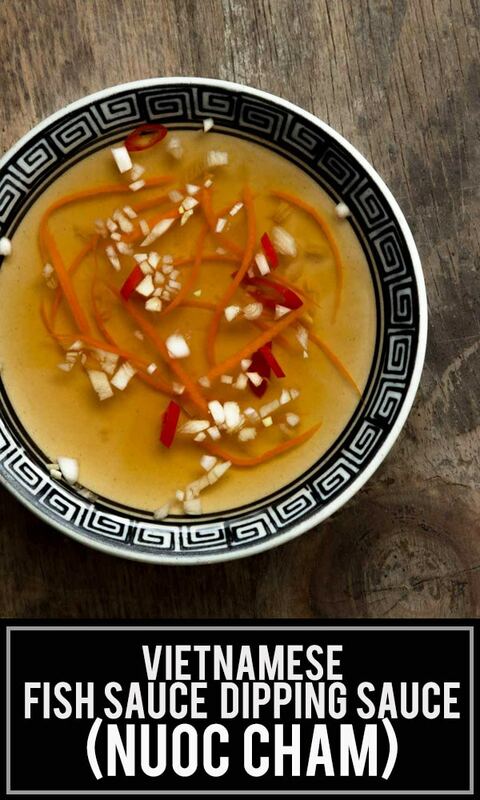 To get a nuoc mam closer to the restaurant style ones, use vinegar instead of fresh lime juice. Keep in mind that fresh lime juice is slightly more tangy than vinegar and has a bit more flavor though. 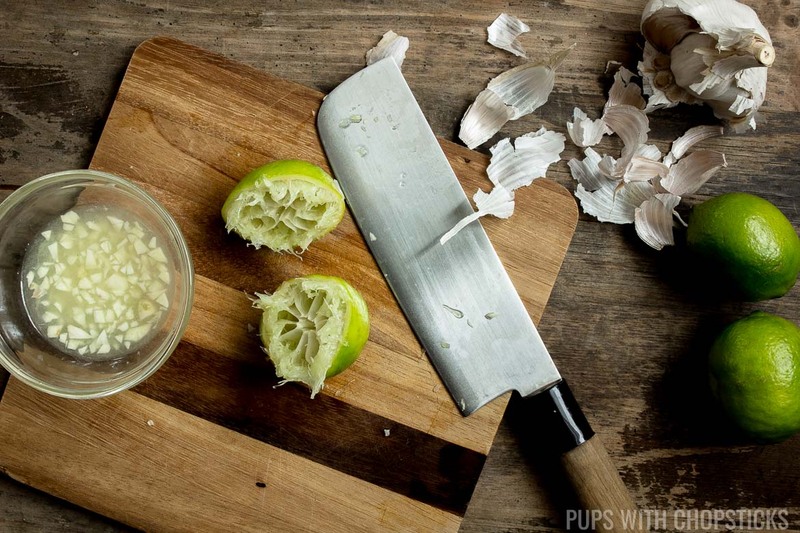 To reduce the raw bite from fresh garlic, soak the garlic in the lime juice for 10-15 minutes. The acid mellows out the garlic slightly so it has less of a spicy bite.